I love April!! Not only is April when Spring finally begins to come, but its my birthday month, AND on the 22nd is Earth Day. For some reason I have always been drawn to Earth Day, and I am sad that we don’t celebrate it more as a culture. This earth is our home and I want to respect and care for it, Earth Day can be a great reminder for us to slow down and do that. Earth Day started in the 1970’s as a response to a public who was largely oblivious to environmental concerns. In many ways I think that we still have the same problem. The public is largely oblivious to the problems that all of our modern advances have taken on the environment. We consider pollution and toxic waste as a normal part of the human experience. We fill our homes, bodies and our world with toxins and chemicals that are not only hurting us, but the animals and the earth. So let’s raise the public awareness this year around Earth Day, and maybe make a few changes ourselves. Even just a small change is a step towards improvement! Sometimes that is good enough. 1) Start using a reusable coffee cup or grocery bag. Eliminate single use plastic in your life to minimize environmental impacts and as a bonus, to save you money! At our home I try to carry a reusable coffee mug when I go to the coffee shop, and I carry a stainless steel water bottle. Not only is this good for the environment but it’s better for my families health! 2) Plant a tree … and if you have kids, go plant a tree together! The National Wildlife Federation offers an opportunity for groups to apply to receive free trees to plant in your community (Arbor Day Trees). It can be such an awesome way for kids to have fun together playing in the dirt, doing good for the environment. It’s outdoor education disguised as playing in the mud. 3) Find a local farmer’s market! As we approach spring and summer, you will begin to see local farmer’s markets popping up in your area. The farmer’s market is a wonderful place to find organic and local produce, while supporting local farmers. Buying in season is better for the earth and honors her rhythms and seasons. It is good for our bodies as we honor our natural rhythms as well. 4) Organize or join a neighborhood or park clean up. You can do a simple search online to see if there are any city wide cleanups, such as keepamericabeautiful.org. Otherwise, you can create your own cleanup team with your family or neighborhood. Host a block party or barbeque as a thank you for neighbors who join in your efforts to keep your neighborhood beautiful. 5) Crafts!!! Visit this site (http://holidays.kaboose.com/earth-day) for fun craft ideas to expose your kids to earth friendly ideas. 6) Encourage pollinators. Bees and other pollinating species play an essential role in any garden but especially ones with fruit trees, berries or squash. Bees have been having a rough time the last few years, with some species’ populations crashing dramatically. You can do the bees and your garden a favor by adding plants they find especially attractive. Lavender, white clover, heather, bellflower and yellow mustard are among the many options. 7) Everyday is Earth Day! Use Earth Day to create awareness of how important the earth is and of our responsibility to take care of it. Then just apply your new knowledge and ideas to every other day of the year. At Aroma Seize we have a special soap that we love to bring out for Earth Day! 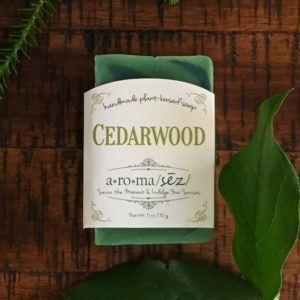 Our Cedarwood soap is a beautiful mix of vibrant blues and green to remind you of the earth. Warm, woodsy and grounding. This soap has a fresh earthy aroma and is wonderful for treating the skin and calming the spirit. This moisturizing soap bar is infused with natural essential oils, including cedarwood. It gets it’s unique color from natural coloring and micas. Let’s celebrate Earth Day every day, but especially this month. To our health and the earths, with love.